No doubt, we all remember where we were on 9/11, and hearing the sounds replayed after 15 years bring back the vivid memories of the horror we all felt brought on by the events of that day. Our lives were forever changed. 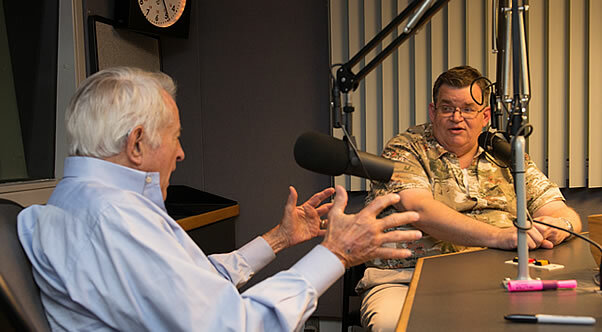 “Our Town” host Andy Ockershausen sat down with 34-year news veteran WMAL News Director John Matthews to relive one of the most horrific days in our town’s history. Listen now at the media player above. Andy had a tennis game that morning at Army-Navy Country Club and had just finished it. He saw smoke billowing from The Pentagon and immediately called the station to report it, and gave his eyewitness report on air. John tells us that Andy “very well may have been THE first reporter on hand” to call into any broadcast station. Andy’s one and one-half minute report – which you will hear at the beginning of the podcast – reveals his initial impressions of the terror. The information he reported to WMAL in the first minute of his report became vital to those who were first responders and helped to determine what should happen next. In fact, it was information that would not be known to the rest of the world for “hours and hours and days” according to John. John starts out that crisp, clear September day – “one of the 10 perfect days” that Washington has each year – handing out assignments to his news staff. The big stories that day were to focus on Michael Jordan joining the Wizards, and Gary Condit’s alleged link in the death of Chandra Levy. Finally, John and Andy discuss how even though changes have been made to improve on how we do things in our town since 9/11, some things remain the same despite efforts for change. For instance, we have better cell phone coverage and most local radio stations have access to national news wire, but efforts for city-wide evacuation plans seem to come and go without resolution. Listen in to John and Andy’s lively discussion on what changes our town has and has not seen since that fateful day. We chose this story as the springboard for “Our Town” – a new podcast series that formally debuts on September 21st. It made sense to us to kick off our inaugural season with what Andy calls the “most memorable broadcast day” of his life, and one of the biggest stories in the history of our town. In addition to John Matthews, Andy has interviewed over 30 Washingtonians in the last few months for our first season. We invite you to listen in to each episode as they roll out over the next several months. Andy encourages his guests to tell their stories by asking questions only he can. His deep understanding and knowledge of the recent history of Washington, DC during the 60s, 70s, 80s, and 90’s and his close relationships with his guests give him that edge. You will be intrigued and delighted with each individual’s story and their retelling of their personal connections and contributions to our town. Please share Our Town with your family and friends, and feel free to leave a comment. Thank you. Couldn’t be a better person to tell the intimate stories of D.C. than Andy O. A great idea!!! Looking forward to all the podcasts. Thanks Janice and Andy. Thank you, CindyLou, for your support and endorsesment! We hope you enjoy each episode of Our Town as much as we do!